Politics in 1920s Louisiana was a dirty business dominated by influence peddling and cronyism. Traditionally, the governor marshaled support by giving out state jobs and lucrative contracts to supporters. Unsalaried, part-time legislators received jobs and cash for doing the bidding of the corporations. Huey employed many of his predecessors’ tactics to get his programs passed; however, he never received the corporate and media support that the “Old Regular” politicians enjoyed. Upon his election, Huey transformed the state bureaucracy, installing supporters in every level of government and often placing a premium on competence over cronyism. He cultivated loyalty by giving people a chance to work in his administration, and it soon became common practice for average citizens to approach him for a job, college scholarship, or any other type of assistance. Huey immediately pushed a number of bills through the legislature to fulfill his campaign promises, including a free textbook program for schoolchildren, night courses for adult literacy, and piping natural gas to New Orleans. He also launched a massive building program of roads, bridges, hospitals, and educational institutions. Huey's bills met stiff opposition from many legislators and the state’s newspapers, which were financed by the state’s business interests, but Huey used wily and persuasive methods (see "Long's Political Methods") to win passage of his bills. Huey was in a hurry to get things done and passed scores of laws that enabled him to enact his programs. A legal genius, Huey used the law to his advantage without breaking it. Opponents accused Long's administration of graft and overspending, when in fact he ran a fiscally tight ship. Louisiana had the third-lowest cost of government in the nation while providing unprecedented services to its people. 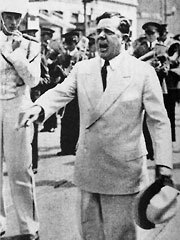 Huey Long leading the LSU marching band. As Governor, Huey became an active promoter of Louisiana State University. He expanded the campus, tripled enrollment, and built LSU into one of the best schools in the South and the eleventh largest state university in the country. Huey lowered tuition and instituted scholarship programs that enabled poor students to attend. He also established the LSU medical school to meet the state's desperate need for new doctors. He frequently attended LSU football games, giving locker room pep talks to players and advice to coaches, and he even composed the LSU fight song, “Touchdown for LSU,” which is still played before every football game. The public soon began to see the tangible results of a massive building program to modernize Louisiana. As the nation plunged into the Great Depression after the stock market crash of 1929, thousands of Louisianians were at work building the state’s new infrastructure. Louisiana employed 22,000 men just to build the roads — ten percent of the nation's highway workers. With greater access to transportation, education and healthcare, the quality of life in Louisiana was on the upswing while the rest of the nation declined. To finance these improvements, Huey restructured the tax system, shifting the burden from the poor to large businesses and the state’s wealthiest citizens (see "How Did Long Pay for His Programs?" below). Huey taxed oil operators to finance his free textbook program, provoking the wrath of Standard Oil, which launched an unsuccessful attempt to remove him from office. 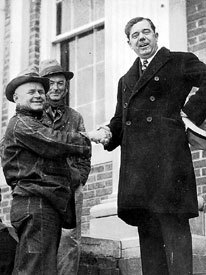 When opponents blocked Huey’s bills in the 1930 legislative session, he responded by running for the U.S. Senate as a referendum on his progams. After his commanding victory, Huey pursued his agenda with renewed strength and formed an uneasy alliance with the “Old Regulars” and their chief, New Olreans Mayor T. Semmes Walmsley (nicknamed “Turkey Head” Walmsley by Huey). The alliance guaranteed support for Long’s programs and candidates in exchange for major structural improvements in New Orleans. How Did Long Pay for His Programs? According to historian T. Harry Williams, "Louisiana was known as a state that levied remarkably few taxes ... not enough to support the kind of program Huey envisioned. The most lucrative one, the property tax, bore more heavily on the taxpayer of average or below-average means." Long's ambitious road-building program was funded by bond measures that were voter-approved and backed by a gasoline tax. Long's education programs were funded by increasing the severance tax on natural resources extracted from the state by various industries based on quantity, which increased state revenue particularly from the oil industry. The funds for hospitals and other institutions came from taxing carbon black at one-half cent per pound. Conversely, Huey slashed personal property taxes and fees, shifting the burden of government financing from the public to industry. Louisiana's total government operating costs (state and local) were $41.97 per capita - third-lowest among the 24 states that kept such records. During Long's governorship, taxes rose 2.2% compared with a national average of 4.7%. * Some of Long's programs were completed by his successor, Gov. O.K. Allen. 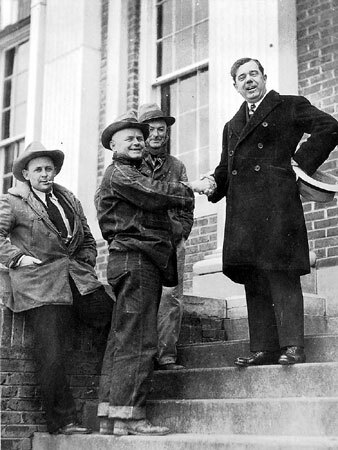 Huey Long shakes hands with constituents on the courthouse steps. What was the Deduct Box? Most state employees who received a job from Long were expected to contribute to his campaign fund, which was kept in a locked “deduct box” at his Roosevelt Hotel headquarters in New Orleans. Without a base of wealthy political contributors, Huey reasoned that this was an appropriate source of funds for his political activities. He refused to take the usual bribes offered by business in exchange for their support, and he was frequently in need of cash to print circulars and travel the state to advocate for his programs and combat negative press. According to historian T. Harry Williams, Long collected between $50,000 to $75,000 each election cycle from state employees, contrary to exaggerated reports that he collected a million dollars per year. Few employees complained about the deducts, because jobs were scarce. They knew they would lose their jobs if Long lost his. Huey did not personally enrich himself with these funds and had surprisingly little money to his name when he was killed. The deduct box was never found and is believed to have been stolen by one of his associates. Huey Long shocked the political establishment by throwing the aristocracy out of power and building a mightier political machine than the one he toppled. Conservatives called Long a ruthless, dictatorial and corrupt demagogue, and they relentlessly opposed all of his reforms. To fulfill his mandate, Long mastered the patronage system his opponents had created, and he out-politicked them at every turn. He fired and hired state employees at will, packed local governing boards with supporters, brow beat legislators to vote with him (or bribed them with jobs), passed scores of laws in rapid succession, reduced the powers of city governments that opposed him, and publicly ridiculed the old guard for their reactionary outrage. With each victory, he relished humiliating the "pie eating politicians" and reveled in his role as the people's champion. "Everything I did, I've had to do with one hand because I've had to fight with the other hand," he said. Read more quotes on Huey Long's political methods.